“A Tale of Two Hoodies” (2012) is an oil painting by Michael D’Antuono, a White American artist. 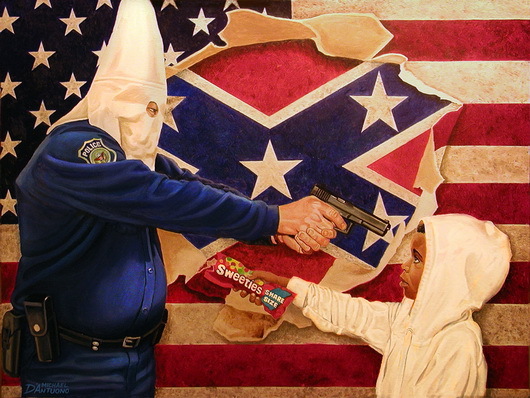 It shows a white policeman in a Klan hood holding a gun on a little black boy in a white hoodie while he holds up a bag of Sweeties that looks like a bag of Skittles. On the wall behind them a dirty American flag is partly peeled away to show the Confederate flag that whites fought under to defend slavery. 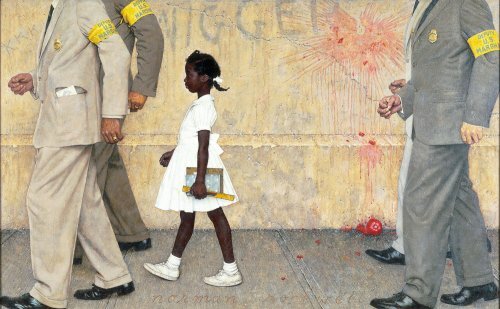 Inspired by the Trayvon Martin case, this painting symbolizes the travesty of racially profiling innocent children and how present day prejudices affect policy. The asymmetry of racism – Many whites see blacks and whites as being equally racist and equally powerful. Yet blacks are outnumbered by whites by more than 5 to 1. Whites have a hundred times more wealth. They run most of the institutions of society. That would not matter if they were not racist, but they are, so it does. 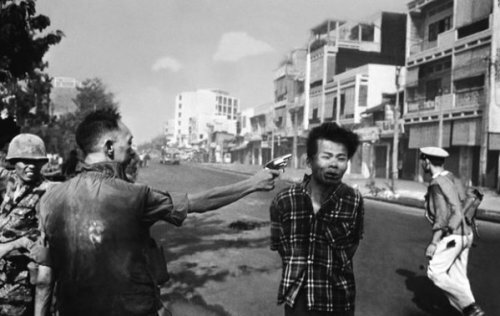 The picture shows that imbalance: not only does the white person hold the gun, he is older and bigger and is pointing the gundown at the black person, making it even more asymmetric than the Vietnam War picture. The picture can also be read as “stealing candy from a baby” – which pretty much sums up the relationship that whites have had with blacks from that moment some 500 years ago when they arrived in Africa with – guns. The Klan with the badge – That might seem over the top but it is not. The police and the Klan have a common root in the slave patrols. So much so that my picture of the police was pretty much that of a slave patrol – before I even knew what a slave patrol was! The police get away with murder, racially profile, act above the law and see blacks more as some kind of threat than as people to protect. Whites have not changed deep down – as shown by how the Confederate flag was right there behind the American flag the whole time. Most white people are like that. You can tell because they are more upset at being called a racist than at being a racist. In that he painted about race in a Rockwellian style, it brings to mind ”The Problem We All Live With” and how little progress has been made.